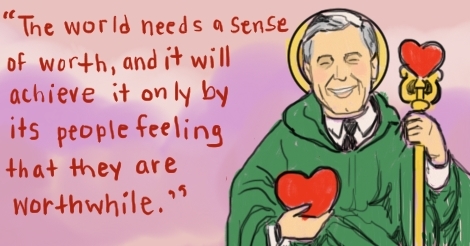 I have been a dedicated follower of Mr. Rogers and his religion, which I have as of this sentence decided to call “Neighborism,” for many years now. 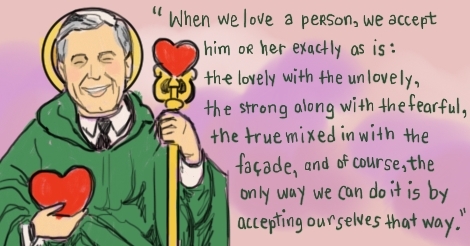 He is one of the most-revered saints in our personal religion, too. One of the first to be canonized. I study his texts in the form of at least two books, watch interviews and full episodes of his shows when I think of it, and read his quotes a whole awful lot. But I have taken it one step further by trying to actually live that life lately. “I’ve never been a kind of hyperactive, runaround kind of person. I think one of the greatest gifts that we can give anybody is the gift of one more honest adult in that person’s life — whether [the recipient] be a child or an adult. And so, for me, being quiet and slow is being myself and that is my gift. Most of us have wondered aloud to ourselves and each other how Mr. Rogers was such a good person. He was a pure being, probably an actual angel or something, I don’t know how actual religious things work. Who could be so genuinely patient and caring? How! Loads of people have been so sure that he had a hidden past filled with all of the bad stuff, because believing that everything is at least a little horrible is comforting to them. And I can understand that. It is actually intimidating to see that a human being can get this close to perfection. But, friends. We can try. Do you remember the concept about “change beginning in your own back yard”? It really applies to so many things. Imagine the difference it would make if each person on earth decided to do their best at every opportunity. And if no one worried, “what if I am the only one?” If you are the only one being wonderful, how could that negatively impact you? It might even start a trend, so go for it. Please. Start right now. Mr. Rogers repeatedly advocated the notion of being a good person: trustworthy, honest, and willing to help others. Being friendly to others, even strangers, and listening to what they have to say is a courtesy that more people could stand to practice. Even if you disagree with someone, you don’t have to turn it into an argument. Remain patient and calm, and if nothing else, ask questions to see why they believe what they do. It is possible that through gentle questioning, they will discover the flaws in their logic on their own. Also, it is possible that you could see the flaws in yours! If there is an emergency, you help. We all know that “helpers” quote by this point. Whenever there is a man-made disaster, look for the image macros of Mr. Rogers talking about how his mom would tell him to “look for the helpers.” We’re adults now. We can be those helpers! And we will do our best to be good, and to make good decisions. This is an integral part of being a Good Neighbor, of course. It is a large component of that “listen to people” thing I mentioned. Respect is what you give someone when you follow the Golden Rule and treat others as they would like to be treated. So you don’t belittle them, berate them, or make them feel less than. As he would tell us every day on his show: Everyone is different, and no matter how different someone is, they still belong and they are just as worthwhile as anyone else. Respect extends to the world around you, the animals and the Earth. Mr. Rogers was a vegetarian. I’m not sure I have ever read why, but I bet I can guess. I’ll keep that to myself though. I don’t want to start RUMORS. Objects, too, benefit from being respected. They last longer, and stay in better condition. I suppose you could see how well things last when you take care of them, and extrapolate that to see how living things react similarly. Including yourself! Respect yourself. Self-respect, -esteem, -love, etc, are incredibly important. You know that common saying about, “How can you expect to love someone if you don’t love yourself,” or something to that effect. You must treat yourself well in order to feel good enough to know what is good for you. You can better control the types of life scenarios you experience, and your reactions and attitudes towards them. If a person or situation is toxic to you, if you respect yourself, it is easier to extract yourself from the worst of it — including your own toxic thoughts. Mr Rogers was vegetarian, as mentioned, and he also exercised every day. He kept routines, like the most boring person who ever lived, some might think. But there are so many ways to live a life, and he knew what was right for him. Don’t judge. Every morning, he would go to the YMCA and swim for his health. Routinely exercising allows you to have an amount of time dedicated to the physical you, showing it and yourself that you value it. It’s worth the time. Similarly, Mr Rogers spent a lot of time sitting in silence. Some people might know this as “meditation,” but I don’t think he used such a fancy word. He felt that the world is frenzied, filled with antics, flashing lights, noise, and distractions. Being alone with your thoughts is terrifying for so many people, but it is crucial. Know your thoughts in order to know yourself. Additionally, silence is calming and restorative. Going for a walk in nature is a good thing to do, but sitting alone in a room is also a positive activity. You can sometimes read during this time, but then afterwards, you should think. Think about what you have read and what it means to you. Absorb it. Make it yours. And go ahead and stop rushing. If you take your time, the result of whatever you are doing, from a craft to soul-searching, is of noticeably good quality. “You don’t ever have to do anything sensational for people to love you. When I say, “It’s you I like,” I’m talking about the part of you that knows that life is far more than anything you can ever see or hear or touch… that deep part of you that allows you to stand for those things without which humankind cannot survive: love that conquers hate, peace that rises triumphant over war, and justice that proves more powerful than greed. All of these practices should lead you towards discovering what is essential about you. It is how you form your thoughts, personality, opinions, and your own personal moral code. You can decide for yourself what is good, and how you can live in such a way that incorporates your solid notions of how to be. You are an individual, and no one else is exactly like you. I know it can be stressful and scary to make your own decisions in life, and that is why societies lumber on even when they are broken. People can be scared of change, scared of themselves, scared of other people, scared of what other people might think, and scared of taking what they think of as the risk of individuality. I reckon that a lot of woe present in the world could be minimized if each person felt that it was okay to figure out what they do best, and then be able to do it. Or if they felt that it was safe for them to say what they were really thinking or feeling. I had a moment while writing this where I thought, “this is in no way funny, will people HATE IT?” These thoughts happen all the time, to everyone. But like the astronaut said — don’t discourage yourself from even trying. There’s more to me than just mild comedy and crackpot theories! 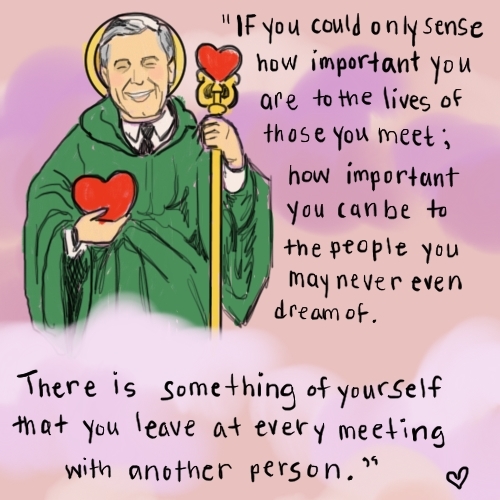 There is more to everyone and to be more like Mr. Rogers, we should strive to find it.